M&M’s The Lost Formulas is a story about corporate mismanagement, wanton workplace hazards, and math. Yes, this is meant to be an educational game focused on math skills. It succeeds in being the harshest math experience I have had since the AP calculus exam in high school. The red and the yellow candies are all set for their tropical vacation when Red thinks to ask Yellow who is in charge on the candy factory in their absence. Turns out it’s the M&M’s Minis who, to put it gently, are not qualified to perform the task. Yellow is charged with returning to the factory pronto and putting things back in order. The first level has him hopping in his ride and racing back to work. The math comes in with math formulas posted on the side of the road. Soon afer, there will be 3 crates on the road. Choose the one with the correct numerical answer and smash through; the crates with the wrong answers are made of steel. So you’re driving at an uncontrollably automatic high speed (scratch that– it’s possible to manually accelerate in short bursts to even higher speeds) in a car with tenuous steering at best, and then you have to worry about solving math problems in real time or smash up against a steel crate. It’s sort of a “scared straight” style of math instruction. All those math tests in school don’t seem so terrible when compared in this context, now do they? The first stage driving will feel safe and secure in comparison to the horrors that await you at the candy factory, which fails to adhere to most occupational safety requirements. 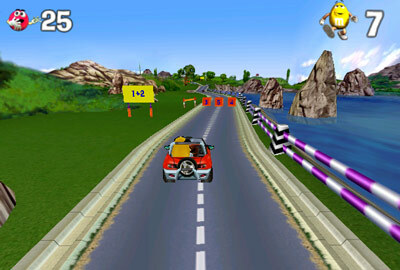 There is more high-speed driving in later levels (including on a forklift). But several levels are influenced by Indiana Jones and the Last Crusade. 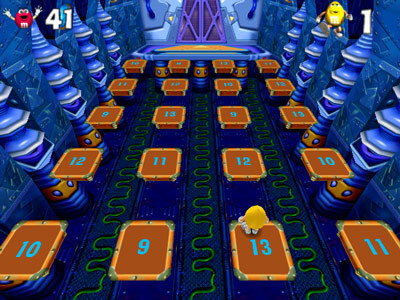 Yellow has to solve math problems in order to advance to the next numerical platform and avoid whatever workplace hazard is down below. Yellow takes a lot of static from Red. Indeed, Yellow’s mannerisms are in keeping with a complete buffoon during the cutscenes. But he is an extraordinarily gifted acrobat as seen during the assorted 3D platform action levels as he effortlessly somersaults to and fro. 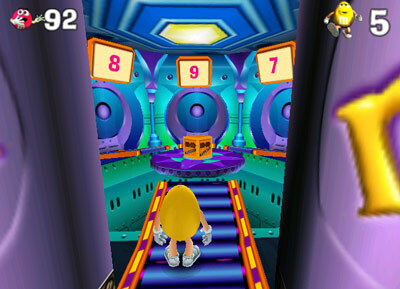 Certain stages have Yellow on a conveyor belt marching towards a platform with 3 numbered doors. What door holds the correct solution? For this one, you have to be paying attention as you were hauled down the belt. There are various monitors with numbers in a certain pattern. Find the number that fits the sequence. It must be noted that The Lost Formulas was developed by an outfit named Boston Animation. Another notable game they have to their record is Darkened Skye, a fantasy game infamous for its tie-in to another popular candy– Skittles. The credits for this game proved nearly pointless to process. While the Simon and Schuster (the publisher) credits were easy enough to understand, when the credits roll down tot he Boston Animation credits, every person gets a photo but most of the names are obfuscated. Based on the MobyGames credits for Darkened Skye, I was able to positively identify a few of the photos and submit them to the database for posterity. But I decided against trying to enter the entire set. I don’t quite understand the motivation for this– The Lost Formulas is a fairly decent and well-engineered game, even if it’s a bit traumatizing in the educational department. They shouldn’t want their names stricken from the record over this work.